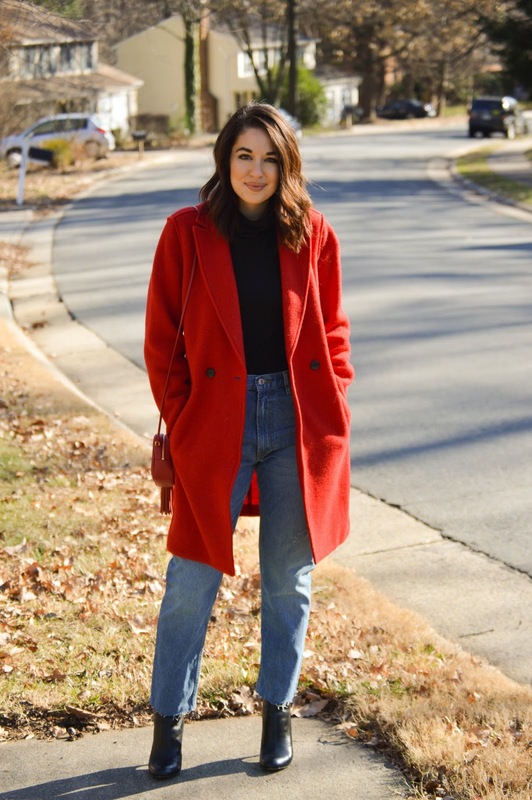 Rosy Outlook: Every Girl Needs a Red Coat + FF Link-Up! Happy Wednesday guys! Hope you had a very Merry Christmas and enjoyed time with friends and family. For those of y'all that follow me on Instagram, you might have seen that on Friday I came down with a horrible stomach virus and pretty much was in bed from Friday to Sunday. Finally Sunday night I started to feel normal and thank goodness on Christmas day I was always completely back to healthy! Even though that put a huge damper on my weekend, I'm glad I was at least able to enjoy Christmas with the family. We had such a fun day and it was extra special for Steven and I as our first married Christmas! Would love to hear what y'all did for the holidays in the comments. This coat I bought during one of J. Crew's big sales and it was SUCH a great purchase. I have been wanting a red coat for years but I thought that I really wouldn't wear such a bold coat as often as I have. 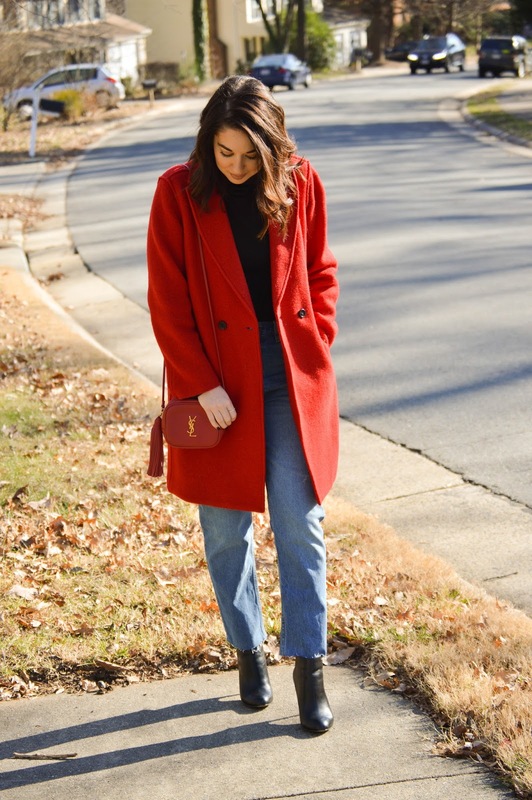 Since you guys know I wear almost only neutrals, this red coat is the perfect statement and honestly goes with every single item in my wardrobe! If you're a neutral gal like me but are looking for a fun, classic pop of color, I think you really need a red coat. That red coat is so cute. I love how you styled it. 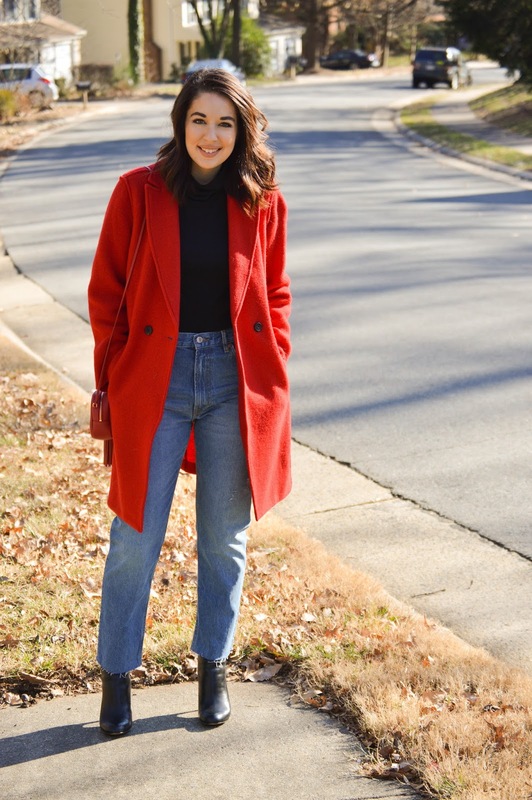 I love the way you styled these raw hem jeans, and I definitely agree that everyone should have a red coat like this! You look amazing! Yes! I couldn't agree more! That red coat is gorgeous and such a fun pop of color! Happy New Year! Love your coat! Not only do I love this coat but those jeans are fab! Love that the red purse matches your coat! I totally agree about the red coat! I have one that I've worn year after year. Love it with those jeans. Such a great coat! Love the color! Red is the color for girls. every girls need to have one red clothes or red dresses at wardrobe same as LBD. Such a fab coat! Love the simplicity of the outfit, and how that color of that coat simply pops out! I am glad you feeling better! Stomach viruses are the worst especially around the holidays. I love your red coat because it adds a festive color to your outfit. LOVE your coat ! So pretty !!! Yesss, a bright + cherry coat is definitely a must. Love this red on you! Totally agree! Love this one on you. Happy New Year! Every girl needs a fabulous red coat, that's for sure! And yours is spot on! I absolutely love it. I hope you had a wonderful holiday. Wishing you a very happy and healthy new year!